Macon-Bibb County has established this website to provide citizens with information concerning parking regulations and the payment of tickets/citations. An overtime parking ticket must be paid within 20 days of issuance to avoid additional fees. Some tickets/citations may not be paid without first appearing in court before a judge. In Appendix III, Part I: Schedule of fines of Municipal Court’s website, you can look up those tickets/citations for which defendants must appear in court before they may pay their fines. Such “must appear” tickets/citations are not payable either online or by phone. The mission of Municipal Court of Macon-Bibb County is divided into two sections: judicial and administrative. The judicial section consists of one full-time and two part-time judges. They are as follows: Chief Judge J. Robert Faulkner; and part-time judges Judge Kathryn W. Gerhardt and Judge Robert E. Herndon. The administrative section of the Court has seven employees, headed by LaTonya Slaughter, Director of the Court. The administrative court personnel staff are organized into two divisions: court operations and data entry. The court operations division, headed by Shemeka Williams, Assistant Court Director/Operations, directly supports the judges in the courtroom and receives payments for court fines and arrest warrants. The data entry division, managed by Natalie Callaway, Assistant Court Director/Data Entry, ensures entering citations into the court’s computerized database and prepares the court calendar. The mission of Macon-Bibb County Municipal Court is to administer justice fairly, impartially, effectively, efficiently, and courteously to anyone charged traffic violations within Macon-Bibb County and with violations of Macon-Bibb County ordinances. Cases filed in the Municipal Court of Macon-Bibb County are for violations of civil rather than criminal code. They include but are not limited to, certain misdemeanor state laws offenses and violations of Macon-Bibb County ordinances relative to environmental violations, traffic violations, parking violations, and other assorted misdemeanors. Some examples of environmental violations include violations of the building code, of the housing code, of the unsafe building abatement code, and of the sanitation code. Traffic violations include moving and non-moving violations committed by or in either personal or commercial vehicles. Some examples of traffic violations include overtime parking, parking near fireplug, parking in hospital emergency door, double parking, and parking in a loading zone. Misdemeanor violations include, but are not restricted to, selling alcohol without a license, creating unnecessary noise, creating noisome odors, disorderly conduct, cutting utility wires, and disfiguring public property. Cases filed in Macon-Bibb County Municipal Court are for violations of certain misdemeanor state law offenses and violations of city-county ordinances, environmental violations, traffic violations, and parking violations. Macon-Bibb County Municipal Court is housed on the first floor of the Government Center (formerly City Hall) at 700 Poplar Street. Access to the Court is through the glass entrance double door on the First Street side of the Government Center. That door is the nearest to the Poplar Street – First Street corner of the Government Center. Municipal Court is expected to re-locate to the Bibb County Courthouse on the corner of Mulberry and First Streets eventually. Before entering the courtroom, everyone must pass through a metal detector to ensure that no one carries any weapons. You can reach Macon-Bibb County Municipal Court by phoning (478) 751-7154, faxing (478)751-2528 or (478)803-2326. Please wait at least five working days after you receive a citation to contact the court. That much time is need for police officers who wrote the tickets to turn them in at the Court and then have them entered in the computer. For information on background checks, accident and incident reports, please contact the Central Records Office of the Macon-Bibb County Sheriff’s Office. The Court’s hours of operation are from 8:00 AM to 5:00 PM, Monday through Friday. Walk-in payments can be made during the hours of 8:00 AM and 4:45 PM Monday through Friday, in cash, by certified check, money order, VISA or MasterCard. The Court is closed on weekends and on the following eight holidays: New Year’s Day, Martin Luther King’s Day, Veterans’ Day, Independence Day, Labor Day, Thanksgiving, Day after Thanksgiving, Christmas. Reporting time for all morning sessions is 8:00 AM. Bailiffs prepare a log of all who wish to enter the courtroom in their order of arrival, give out waivers, and pull court cases for the clerk assisting the judge in the courtroom. In spite of the fact that the Municipal Court is a Court of Common Pleas, certain minimum standards are necessary. All Defendants, officers, spectators, and witnesses are expected to maintain silence during the sessions. In the event excessive noise is created, the bailiff shall warn the person to conform to proper conduct. Failure to obey can result in ejection from the Courtroom, and in extreme cases, charges of contempt of Court may be preferred. Law enforcement officers should keep talking to a minimum. In the event it is necessary to converse with the City Attorney, the Defendant or his or her attorney, please step outside of the Courtroom and let the bailiff know where you are. Officers should set all radios and pagers to a setting so as not to interrupt the proceedings. If an officer is in civilian dress, please dress in a manner respectful of the Court. There is a dress code for all persons coming into the court, including judges, attorneys, witnesses, parties to the case, or even just casual observers of the proceedings. No provocative clothing such as halter tops or tank tops are allowed to be worn by either males or females. Generally, no clothing items with writing or printing or cartoons or caricatures or the like printed on them are allowed; this does not prohibit a shirt with a small logo such as the Nike “Swoosh” or a “polo” player or uniforms bearing the small “over the pocket” names of the employer and the employee. Caps or hats may not be worn in the Courtroom. No shorts are permitted, no matter how “dressy” they might be, and no athletic jerseys or items of clothing resembling athletic uniforms of any type are permitted. All pants or trousers must be pulled up to the waist level. Clothing which allows for underwear of any type to be visible is not permitted, and the wearing of any clothing in such a manner that the underwear is visible is not permitted. Dress or skirt lengths should be such as modesty permits. The Solicitor General of Macon-Bibb County is charged with handling prosecutions in the Court. All motions and attempts at negotiations should be addressed to her/him. All regular sessions of the Court are recorded by electronic means only. In the event a party desires a transcript of a proceeding, it shall be the party’s responsibility to make arrangement with a private court reporter to appear and make the transcript. In the event a party wishes access to the electronic recordings, arrangements can be made through the Clerk of the Court. Those electronic recordings will be available for at least 90 days after the hearing. Should a judge, party or witness desire the recording to be preserved beyond 90 days, they should contact the Clerk of the Court. The electronic recordings are not maintained to be any more than a reference. The quality of the recordings are not always as clear as might be desirable. The following printed fine schedule may be superseded by changes that may not have been entered onto the website. That fee schedule quoted by court personnel at the time of inquiry shall be in full force. If it differs from the fine schedule printed here, it means that this printed fine schedule has not yet been revised to reflect the changes. Fine amounts for violations listed below include not only base fines but also state-mandated add-ons or surcharges for beneficiary funds. Macon-Bibb County Municipal Court is statutorily mandated to collect these fees and transmit them to the State of Georgia. These funds range from 5% to 50% of the base fine amounts. Examples of such add-on beneficiary funds are the following: drug abuse treatment and education fund, county jail fund, police officers’ annuity and benefit fund, peace officer, prosecutor, and indigent defense fund, and local victims’ assistance fund. Pursuant to Georgia Code 17-6-11, if you have been issued a court summons and fail to appear to answer to the charge, a warrant may be issued for your arrest. In addition, a notice is sent to the Department of Driver’s Services for any failure to appear on a traffic violation, and this will result in suspension of your driving privileges. ALL ALCOHOL SALES OR PURCHASE VIOLATIONS MUST APPEAR IN COURT. OVER 40 OR IF THE FINE CANNOT BE PAID AT ONE TIME, THE ACCUSED MUST APPEAR IN COURT. Judge Robert Faulkner has served as Judge of Macon’s Municipal Court since 1989. Originally appointed as a fill-in adjunct judge by Mayor Lee Robinson, he has served Macon during the administration of six mayors; during that time, he has also sat as the pro-tem judge of the State Court of Bibb County. Born in Albany, GA, Judge Faulkner has been a resident of Macon for approximately 60 years. He is a graduate of Lanier High School in Macon and earned a B.A. in Business from Mercer University in 1980 and his law degree from Mercer University’s Walter F. George School of Law. After law school, Judge Faulkner practiced at Phillips & Faulkner until forming Faulkner & Russell, P.C. in 1988. Areas of focus for his practices included real estate title and closings, real property transfers, loan closings, and bankruptcy cases for creditors. They represented HUD, the VA, FHA, and every major lender and many small lenders in the Middle Georgia area. Judge Faulkner handled cases in state and federal court ranging from misdemeanor traffic pleas to death penalty trials, and he was a panel defense attorney for the Macon Judicial Circuit and U.S. District Court, Middle District of Georgia. Judge Faulkner has been married to Lynn Chapman Faulkner for forty-two years, and they have two daughters, Kelley, age 30, and Lauren, age 25. His father, Jimmy Faulkner, age 87, lives at home with him and his wife. His mother, Jackie Faulkner, is deceased. 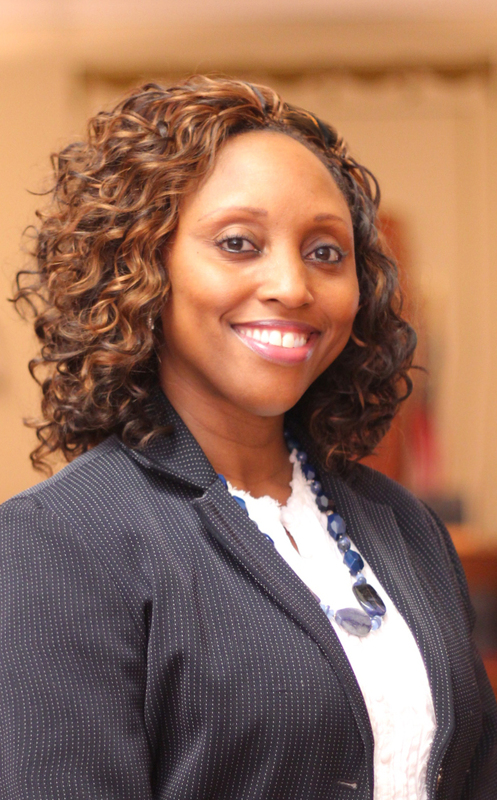 LaTonya Slaughter has been named Macon-Bibb County’s Chief Clerk of Municipal Court after serving as the Assistant Clerk over the Operations Division of the Court since 2003. Previous to that she was Deputy Clerk for Municipal Court and Quality Control for M&S Cleaning Service for almost four years. Mrs. Slaughter holds a Bachelor of Business Administration in Business Management from Brewton Parker College. During her time in Municipal Court, she has implements a courtroom process to that minimized customers’ wait time during their court experience, and participated on the committee to select and implement a new court case management system for all courts. As Deputy Clerk, she assisted solicitors, attorneys, and Sheriff Deputies with case reductions, violation adjustments, course completions, license suspensions releases, and court case rescheduling. She was also responsible for many of the day-to-day activities of the office and the interaction of staff with the public. The Macon-Bibb County Municipal Court is divided into two sections: judicial and administrative. The judicial section includes Judge J. Robert Faulkner, the single full-time judge, and two part-time judges, Kathryn W. Gerhardt and Robert E. Herndon. The administrative section of the Court has eight employees organized into two divisions: court operations and data entry. The court operations division directly supports the judges in the courtroom and receives payments for court fines and arrest warrants. The data entry division ensures entering citations into the court’s computerized database and prepares the court calendar.